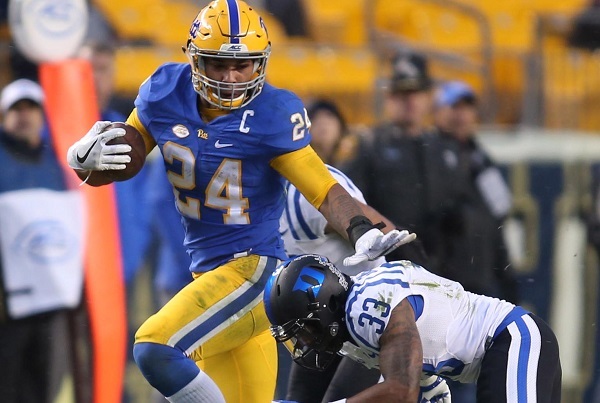 James Conner set the all-time ACC touchdowns record and Nate Peterman threw three touchdown passes as Pitt cruised past Duke 56-14 on Saturday at Heinz Field. Sometimes it all seems right. Saturday, Pitt fans couldn’t have asked for more, as the blustery November evening at Heinz Field yielded a smoking hot performance from the Panthers; offense that helped slam the door on Duke in a 56-14 route. With 461 total yards, Pitt (7-4, 4-3) posted two scores in each quarter with their catalyst, quarterback Nate Peterman showing up solid with an 11 of 18, 237-yard performance. Peterman tossed three touchdowns on the day, including a 16-yard hookup to Dontez Ford with just under two minutes expired in the game opening up the scoring. Ford finished with 39 yards receiving while Jester Weah led all receivers with 95 yards and a score, a 56-yard pass from Peterman with just over two minutes left in the half that gave Pitt a commanding 28-14 advantage. As usual, running back James Conner stole the show for the Panthers, running for 101 yards on 14 carries with two touchdowns. Conner has now rushed for 100-yards in back-to-back games (132 vs. Clemson) for the second time this season. The junior’s incredible career at Pitt has led to 50 career rushing touchdowns and 53 total touchdowns which are both ACC records. The previous ACC record was held by Virginia’s Wally Lundy. With 241 total rushing yards, the Panthers also received big numbers from Quadree Henderson who tapped in with 73 yards on 5 carries, scoring on an explosive 52-yard rush early in the second quarter that put the Panthers up 21-7. Henderson also returned a punt 65-yards to pay-dirt early in the third quarter. Easily its best performance all year, the Panthers defense allowed a conference-low 268 total yards to Duke, permitting just one touchdown, a 6-yard pass from Daniel Jones to Chris Taylor on the Blue Devils’ second possession of the game. Duke’s only other visit the end zone came off a Bryon Fields 36-yard interception return with just over five minutes left in the first half. The Blue Devils gained just 71 total yards in the second half, converting on just three third downs and finding the Panthers’ end of the field just once. James Conner has been lhe motivational, inspirational and athletic leader of the Pittsburgh Panthers for the past three years, and now he’s the ACC leader… in touchdowns. And if you count old Big East rushing records, Conner will most likely surpass all, as just one more score puts him past Lee Suggs, who leads Virginia Tech’s all-time scoring list with 53. That means Conner has surpassed names such as Willis McGahee (Miami), Edgerrin James (Miami), Wali Lundy (Virginia), Ernie Davis (Syracuse), and Jim Brown (Syracuse). Conner, who has rushed for 3,586 career yards—2nd in Pitt’s all-time history behind Tony Dorsett’s 6,526—is 10 touchdowns behind Dorsett’s leading 63 scores in school history. Pitt absolutely annihilated Vegas’ opinion of them, as a nine-point spread wasn’t nearly enough for Duke to cover. Once again the over was also crushed, as the Panthers almost hit the 63 O/U mark themselves. Pitt is now gone over 10 straight times this season, which is now the record in D-1 college football this season. Had you made an innocuous $100 bet on the over in the Pitt-Penn St. matchup then let it ride all the way to today’s game, you just walked away with $102,400 dollars. That’s called a winning streak. It has happened before. Major League’s Lou Brown couldn’t have said it any better, as the Panthers are rolling, winning two straight and following up their 43-42 stunner over Clemson just one week ago. Now bowl eligible, Pitt will look to spruce up its resume just once more this season as they host Syracuse in the regular season finale next Saturday. That game is slated for 12:30 PM.